There are some beautiful roads in North Central California and into Oregon. 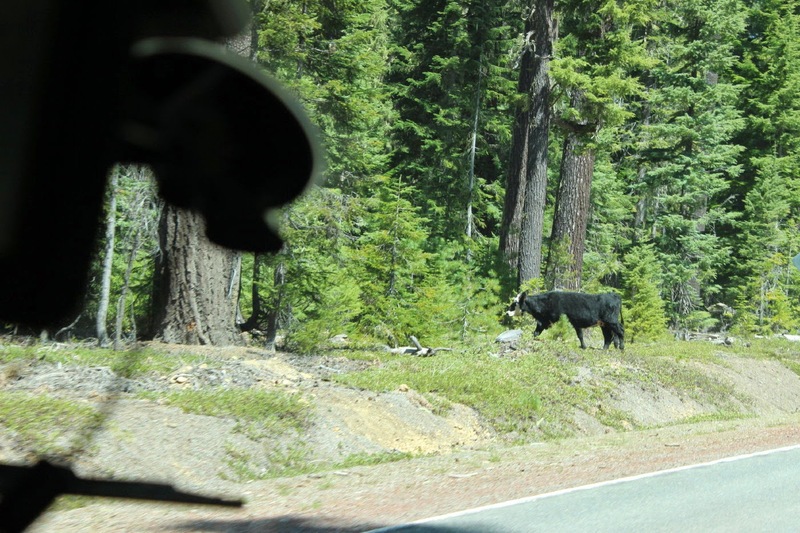 We follow Interstate 5 north from Mt. Shasta into Oregon and the Valley of the Rogue State Park. 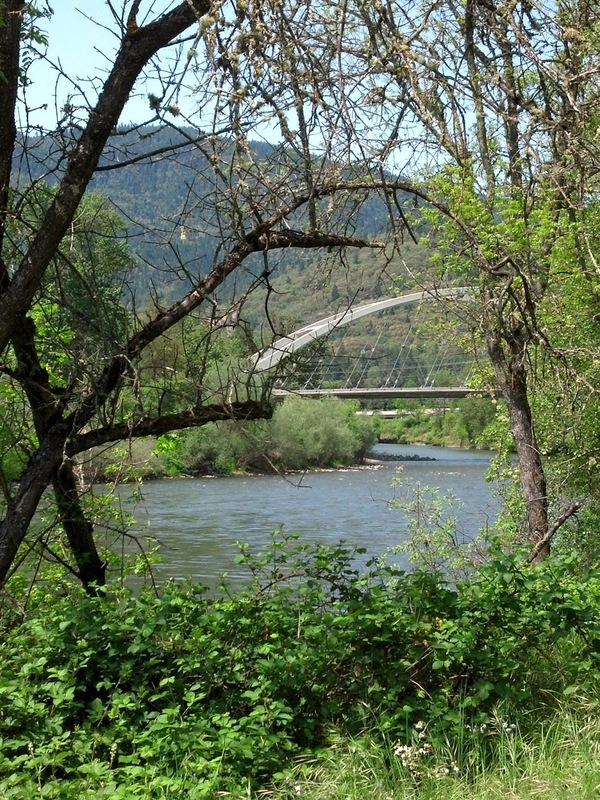 A very scenic park right on the Rogue River with a number of loops for all sized RVs. Also right in the park is a connection to the Rogue River Greenway bike trail. 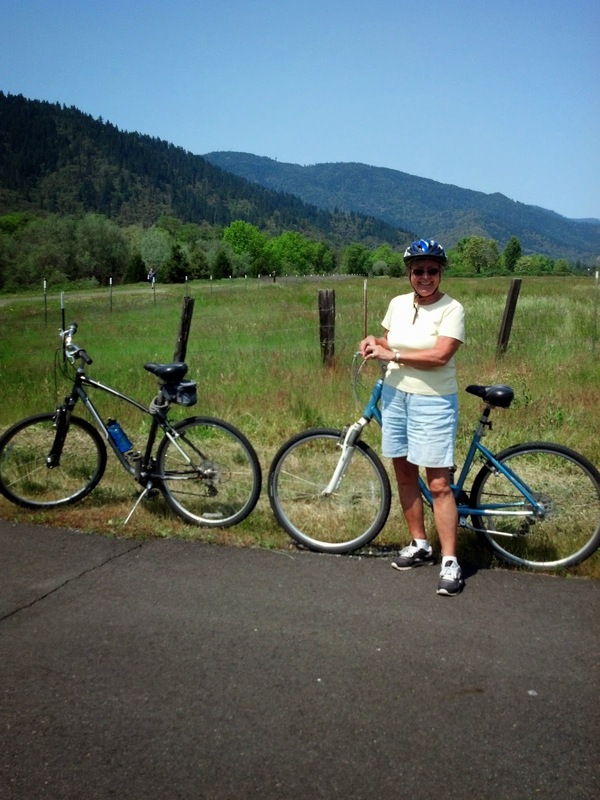 Eventually a 30 mile plus trail, we enjoyed a nice ride from the park to the City of Rogue River. All along are great views of the Rogue and this view of the bridge. Rogue River is a very small city. 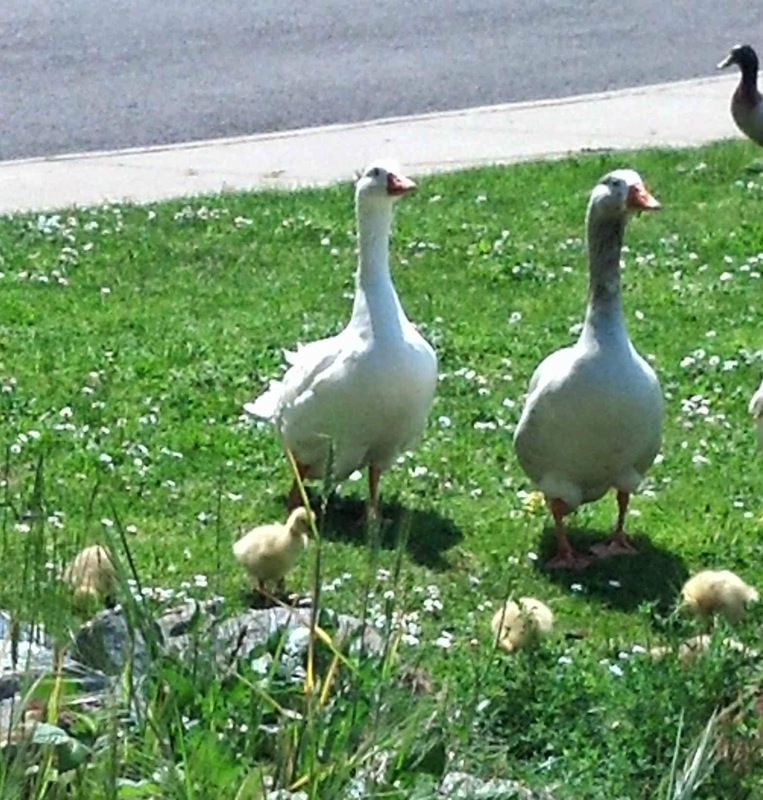 At the bridge is a small park and at least two families of geese. Fun to watch, but don't get too close!! Also, right here, was a great little Mexican restaurant. Jan and I took a break for some tacos, tamale, and an ice cold Mexican Pacifica beer in a frozen mug. 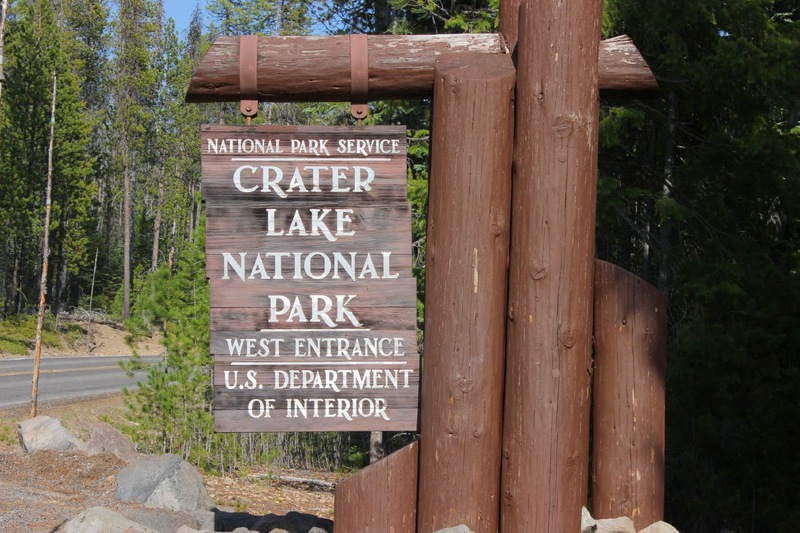 From the state park, we head back on Route 5 for a short distance to Route 234 and then Route 62 north to the west entrance of Crater Lake National Park. The road is good and we are able to stop at the Steel Visitors Center and then up to the Rim Village. On the road you realize that you really cannot see the lake until you are on top of the old crater. When you look over the edge, your jaw drops. An amazing view!! 7,700 years ago this volcano erupted with such heat and force that the edges of the mountain fell into the center. Wizard Island you see in the lake was from later eruptions. 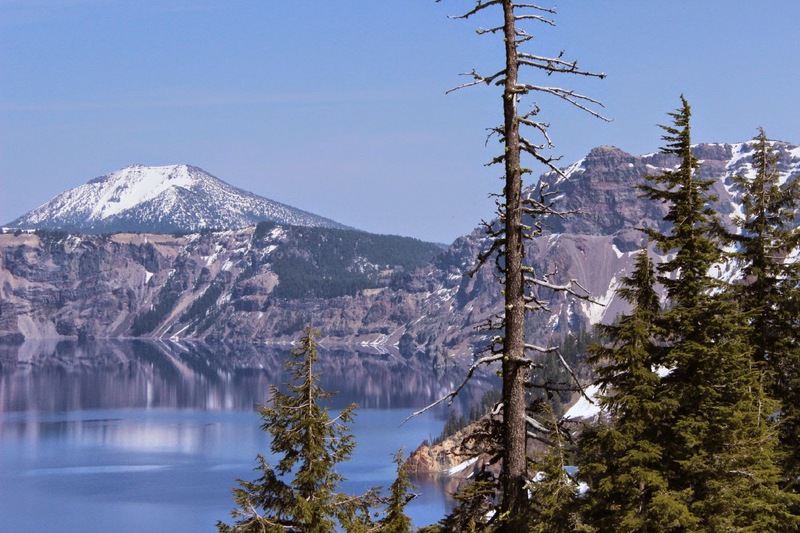 This is the deepest lake in North America at 1,943 feet. There are no rivers in or out of the lake. All the water has formed from rain and snow melt. it is the clearest and cleanest body of water on earth. There are no streams to pollute the lake. The blue you see here is the color we saw on this day. There was still snow on the roads here in May with the elevation of 7,132 feet. The road around the rim was still closed, but we could walk for a little more than a mile to Discovery Point. Some college age men were hiking with full backpacks and tents. We believe they were doing a weekend hike around the rim. That would be 35 miles. The lake itself is about 6 miles in diameter. Just in case you thought we were using stock photos, Jan and I thought we should show you that we were really there! 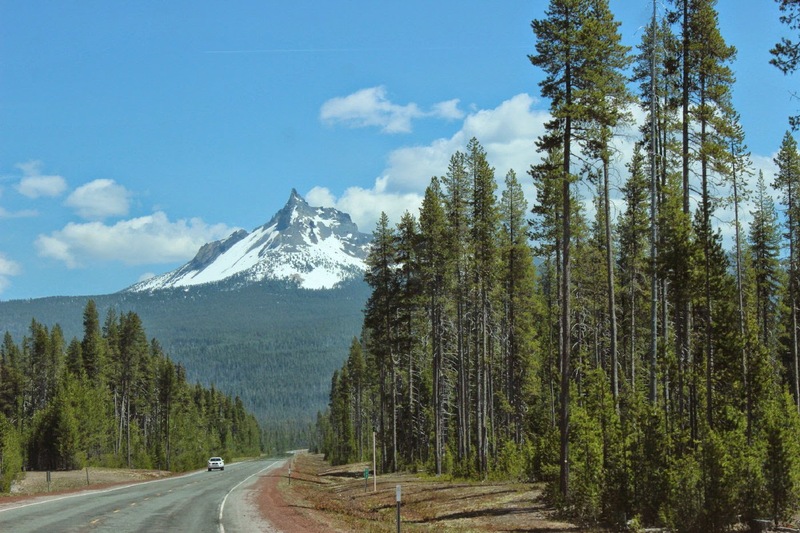 At the foot of the mountain, back on Route 62 is Farewell Bend Campground. 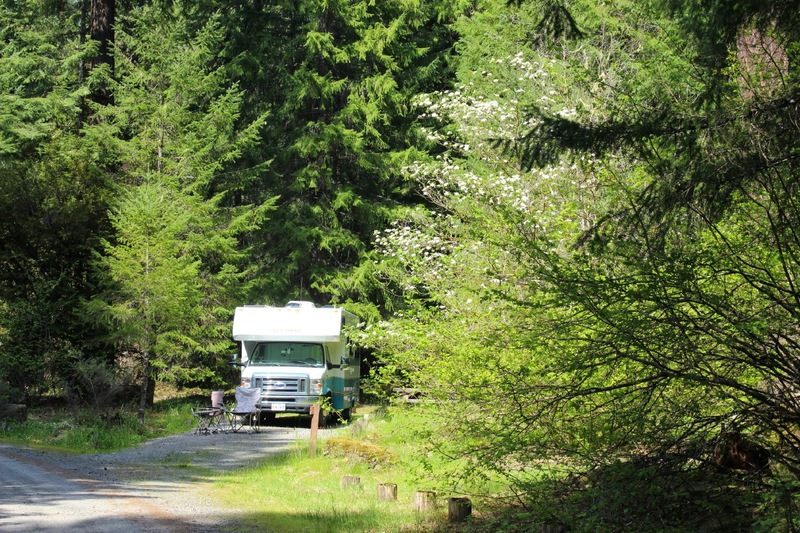 We were pleasantly surprised to find a National Forest campground open. Actually, the hosts indicated they had just arrived and it had just opened. 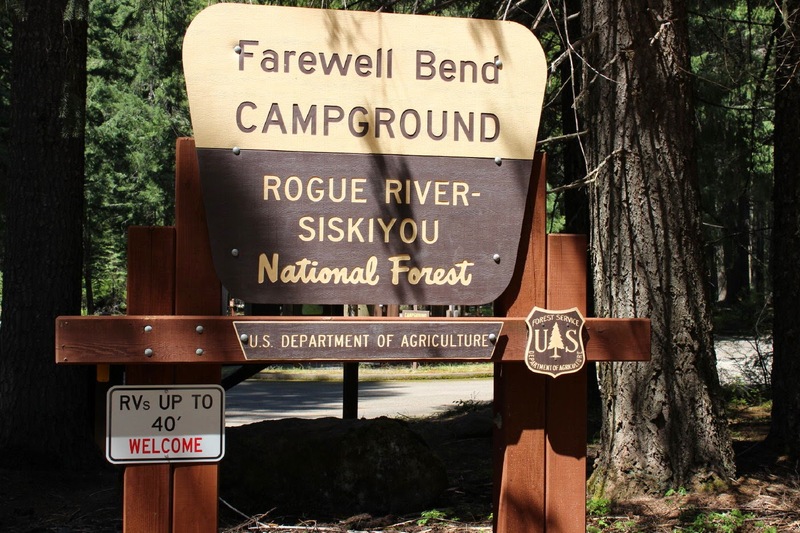 There are a number of campgrounds all along the Rogue River. This one is beautiful! Dry camping with no threaded water faucets and no dump station, many of the sites are right on the river, such as ours. They are well separated and large. This was the view from our site with the fast moving river and the tall Douglas firs. The host indicated that the river is well stocked with trout. He also told a story about a newspaper article recently. A local fisherman was fishing for trout on a 10 pound line and caught instead a 35 pound salmon. Took quite a while to bring it in. Some interesting flowers in the campground. The blossoms remind us of bleeding heart or orchid. 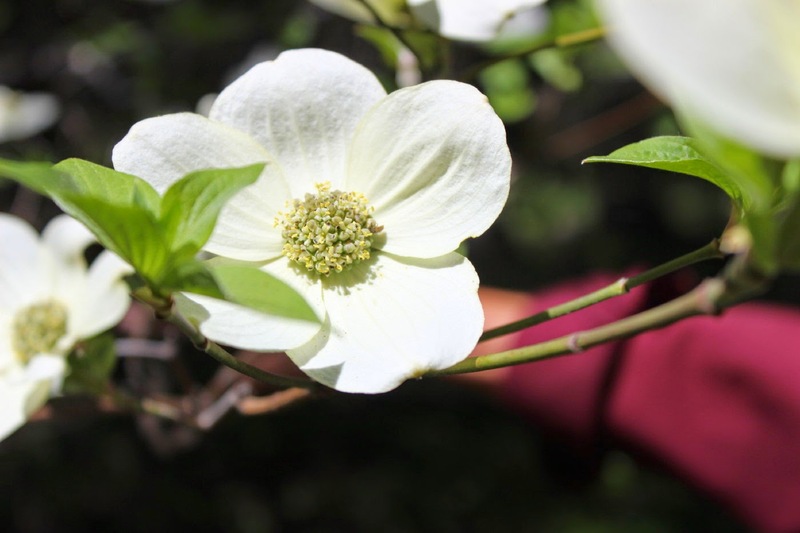 Scattered among the tall pine trees are a number of Dogwood trees. 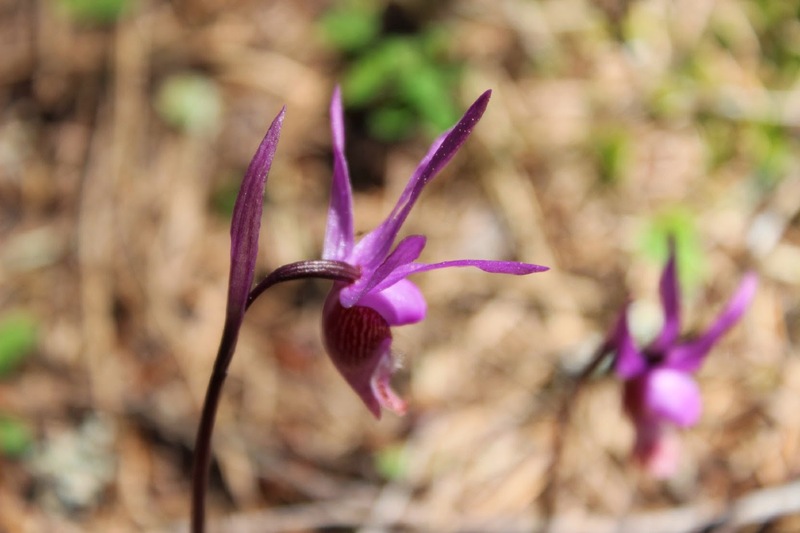 The flowers jump out in contrast to the dark shade of the trees. 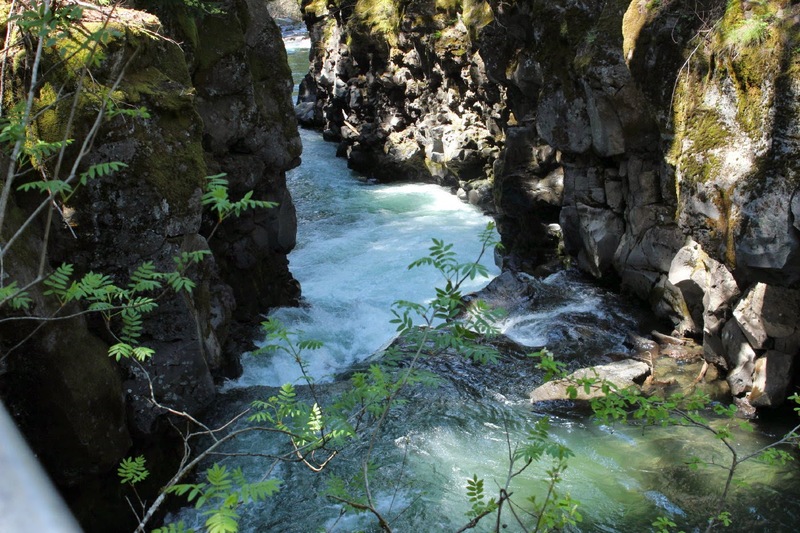 A nice hike from the campground brings us to the Rogue Gorge. All of the water is forced through a narrow slice of volcanic rock. Along the way are a number of rocks that remind us of the Potholes in Shelburne Falls, Massachussetts, near the Bridge of Flowers. No ,Eustis. That is not a deer or an elk. Leaving Farewell Bend, we follow Route 62 to Route 230 north around the west end of Crater Lake and north to Route 138. All scenic. In thick forest. Being national forest, there are no private homes. Also, no gas stations, so plan ahead!! Like in Texas, this is free range for cattle. And these were two that we had to slow down for as they crossed the road. North and west on Route 138. we are treated to spectacular view of Mt. Thielsen. Mt. 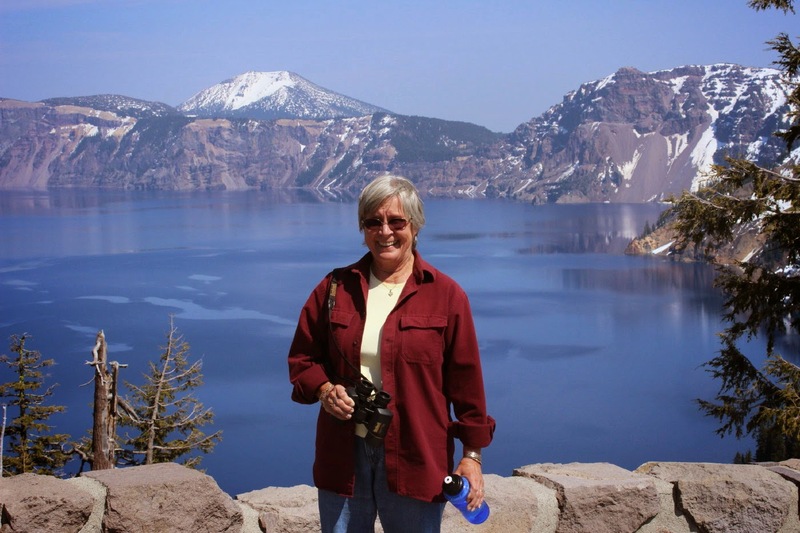 Shasta, Lassen, Mt Mazama(Crater Lake), Mt. Thielsen, and also Mt. Bailey remind you how active this area was many years ago with volcanos. Mt. 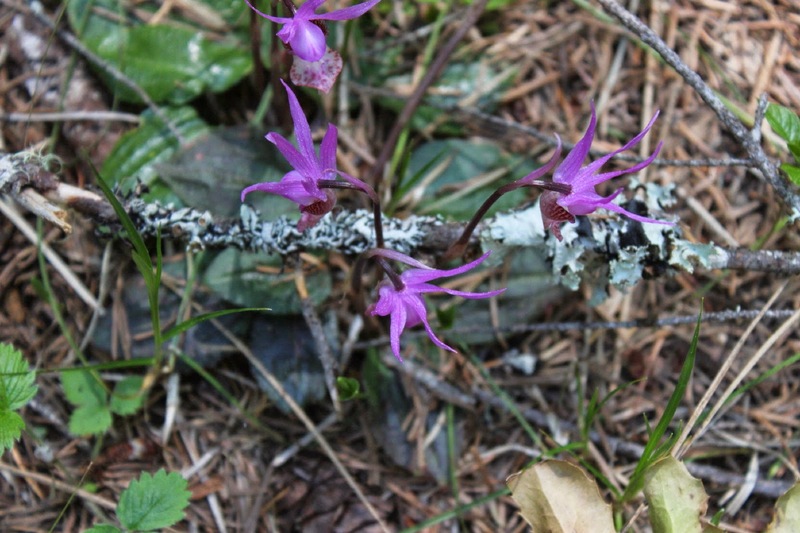 Thielsen is also known as a super lightning rod of the Cascade Mountain Range. Hikers can find lightning strike scars. 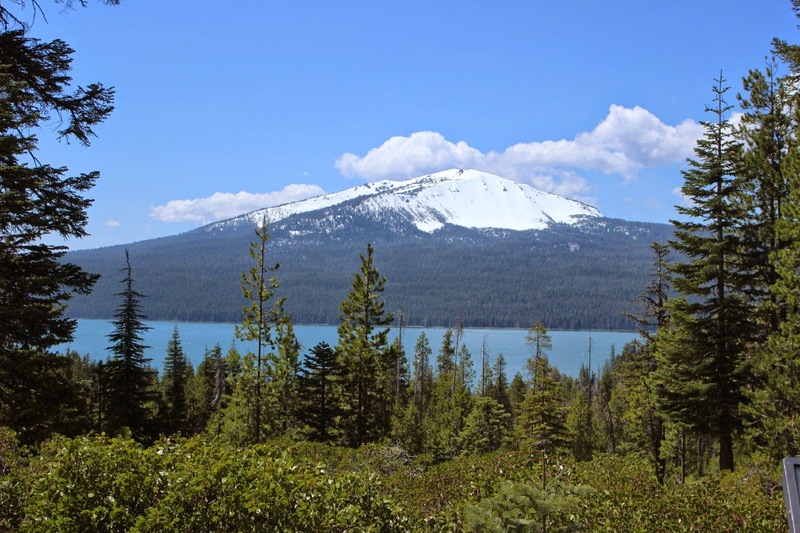 Looking one way at Diamond Lake, you see Mt. Bailey. Turn around and you can see Mt. Thielsen. 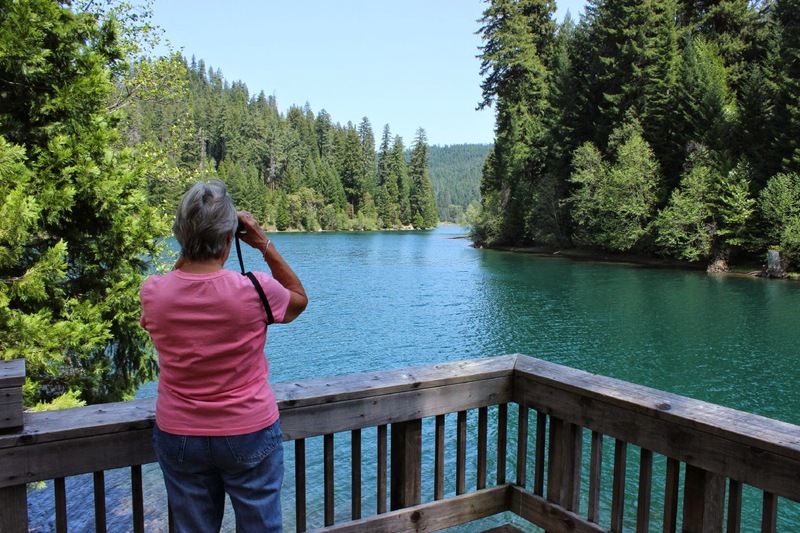 Hard to believe, but no homes or camps because this lake is in national forest land. There are campgrounds around the lake , but very few people at the beginning of May. 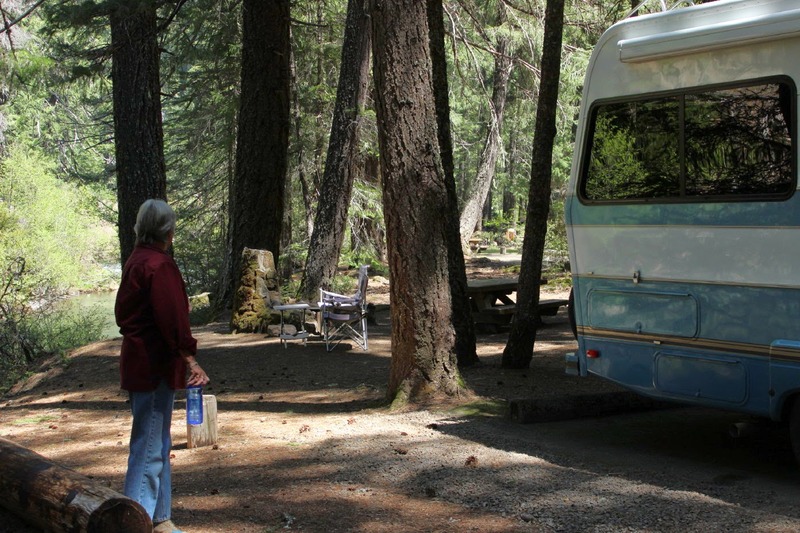 Following Route 138, Jan and I are happy to discover some national forest campgrounds that are open. We are now following the Umpqua River. 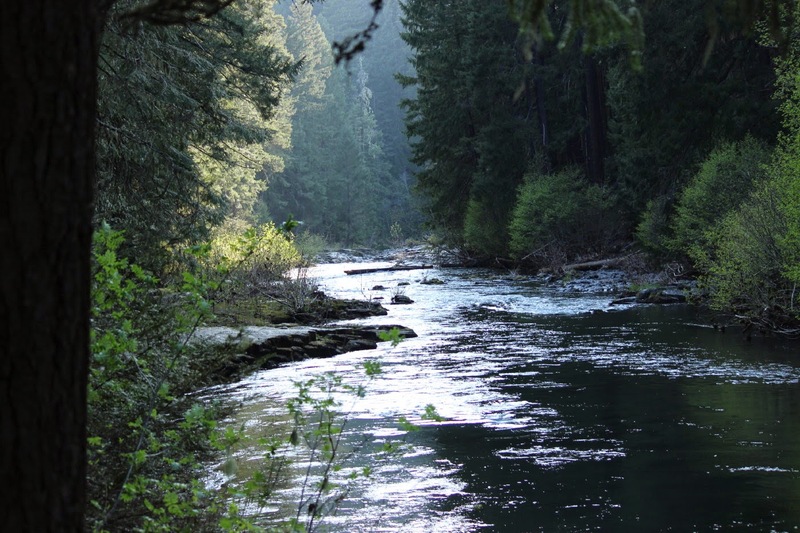 The Umpqua, like the Rogue, flows from the Crater Lake hillsides to the Pacific Ocean. 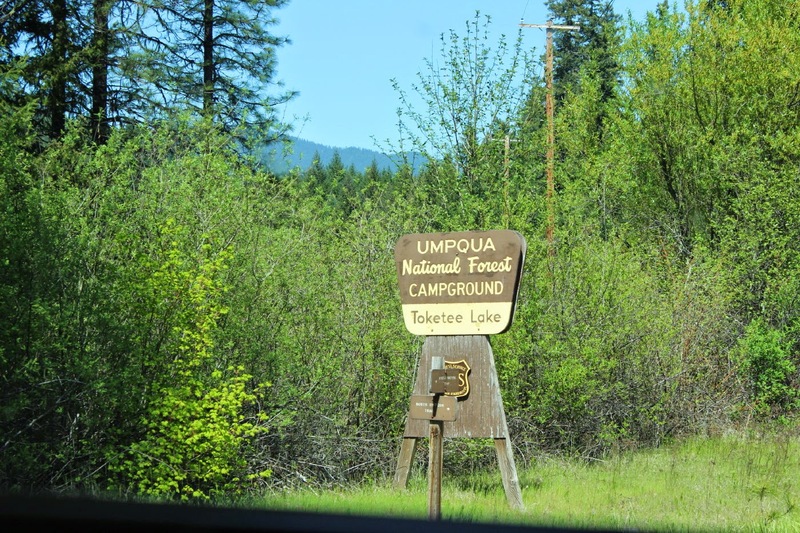 We stopped at Toketee Lake Campground. This lake was formed by the Pacific Gas and Electric Company. To our right is a hydroelectric power plant. One of eight that are located along the Umpqua. It seems that these western states have taken good advantage of river power to create electric energy. 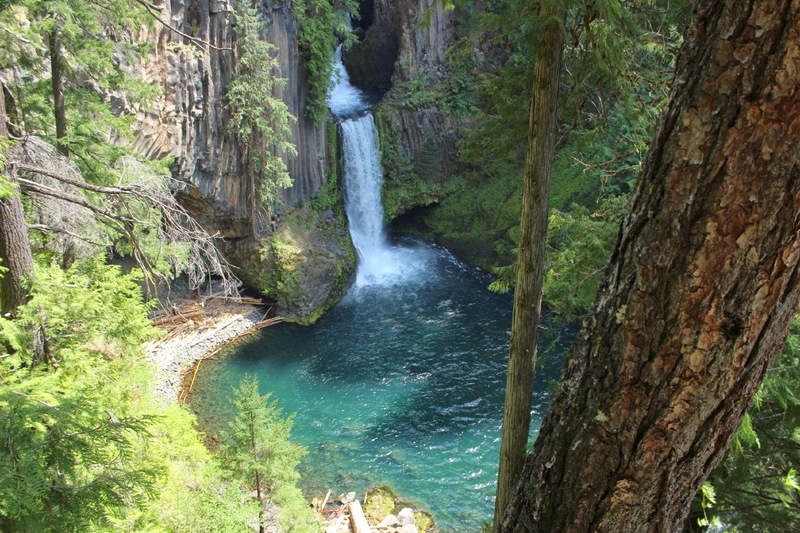 A five to six mile hike takes us to the Toketee Falls. 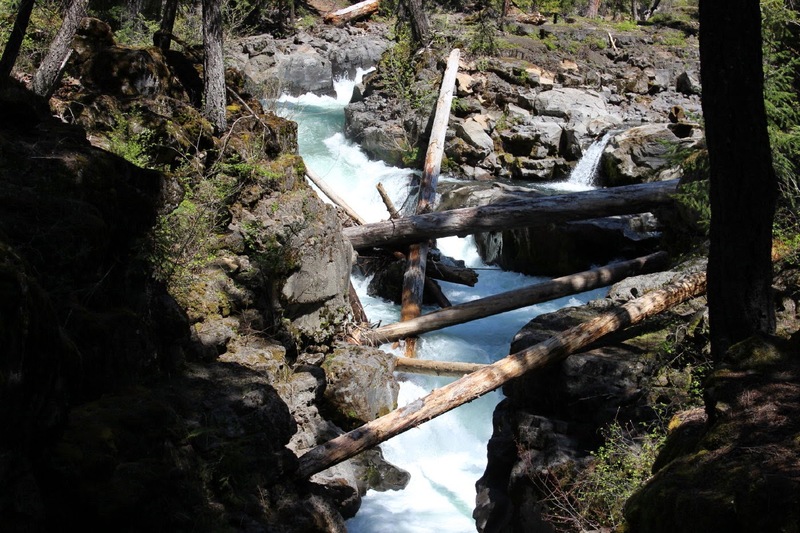 There are a number of falls along the Umpqua River and this is one of the nicest. The trail follows above the river which cuts through the volcanic rock. 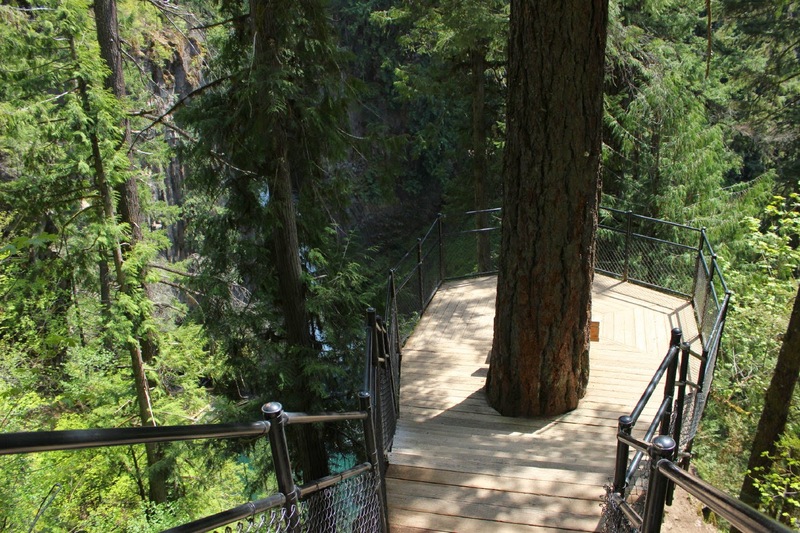 The trail is well maintained with stairs and this great platform for viewing. The falls drop twice once for 40 feet and then for 80 feet. The pool below is quite deep and clear. A little Dutch boy, plugging the hole in the dike, you are not! The power company has many ways of moving water from lakes and rivers to the power generators. 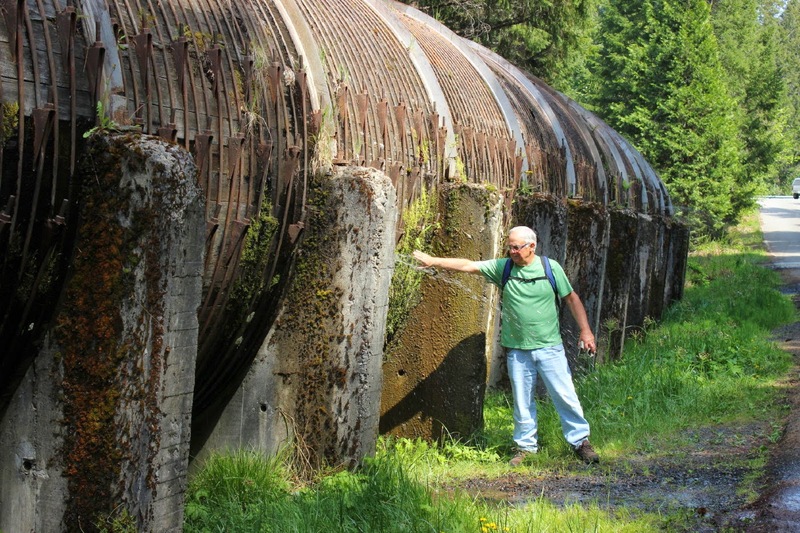 This 12 foot diameter water pipe was constructed in 1949 from redwood staves. Still works great with a few leaks here and there. Heck, I'm a bit older than that and I have a few leaks here and there too! Our site at Toketee Camground is also dry camping. In this case, there is no water at all at the campground as well as no dump station. A very nice, if quiet, campground. This was $5 per night for us old folks.